Traditional meditation cushion, approved for hundreds of years. Suitable for classic techniques used in Zen, Hinayana, Mahayana or Yoga. 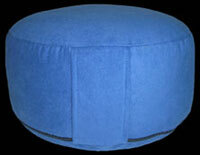 The meditation cushion makes sitting in meditation easier especially for the knees and ankles. High quality velveton cotton cover, filled directly with Dinkel hulls. The spelt hulls filling makes the pillow very flexible. The pillow has an opening on the side to add or remove filling material.